Win SISTERS Blu-ray Combo Pack! Comedy superstars Tina Fey and Amy Poehler reunite in Sisters, the uproarious hit available now on Digital HD and coming to Blu-ray, DVD and On Demand on March 15, 2016, from Universal Pictures Home Entertainment. When the Ellis sisters, the always-responsible Maura (Poehler) and impossibly hotheaded Kate (Fey), receive word from their retired mom and dad that their family home is on the market, they discover they have one weekend left to clean out the old junk in their bedroom. As they comb through the artifacts of their teen years, Maura and Kate’s trip down memory lane leads them to a seemingly crazy plan. Looking to recapture their glory days, the sisters throw one final ”Ellis Island” blowout for their classmates, resulting in the cathartic rager that a bunch of ground-down adults really need. Sisters also features an all-star comedy cast including Maya Rudolph, Ike Barinholtz, John Leguizamo, John Cena, James Brolin, Dianne Wiest, Rachel Dratch, Samantha Bee and Kate McKinnon. And we’re giving away a Blu-ray Combo Pack to a Forces of Geek reader! 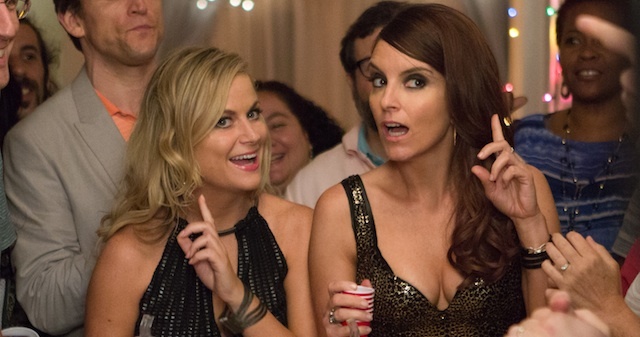 Fey and Poehler previously co-starred in this mismatched surrogate pregnancy comedy? Please include your name and address (U.S. Residents only. You must be 18 years old). Contest ends at 11:59 PM EST on March 27th, 2015. Win LUCY on Blu-ray Combo Pack! Win 'Paradox' on Blu-ray Combo Pack! Win a 'Gintama' Blu-ray Combo Pack!